Covington will celebrate its native son, William Goebel, the controversial state senator who ascended to the position of Governor under dubious circumstances and was sworn in on his death bed, days after being shot by an assassin's bullet in Frankfort. Legend has it that Goebel's last words were, "Doc, that was one damn bad oyster". In true Covington fashion, he went out with a dose of humor. Now the Awesome Collective of Covington and the Center for Great Neighborhoods proudly present a tribute to Governor Goebel on the anniversary of his death, February 3. "So you guys have William Goebel, right? People didn't like him as a politician because they shot him dead, right? We should throw a William Goebel oyster party in Goebel Park," he suggested. Goebel died from his gunshot wound in 1900, days after being sworn in as governor. Legend has it that Goebel's last meal was oysters and as he faded, his final words were along the lines of, "Doc, that was one damn bad oyster." "It probably wasn't the oyster, it was probably the gunshot," Van Meter joked. Van Meter seemed pretty committed to making a February event happen. "And if somebody dies from an oyster, that's kind of good. It's like recreating history," he laughed. Van Meter returns to Covington for the party and will portray Goebel in an assassination reenactment. The Awesome Collective began the early stages of planning the event during a trip to Sacramento where members attended the NeighborWorks Community Leadership Institute. On February 3, one hundred fourteen years after Goebel died, the One Damn Bad Oyster Party will be held at Goebel Park in Mainstrasse Village. The event will raise funds for a new community award. Organizers from the broader community, who have spent weeks planning the event, are ordering oysters directly from oyster farms. "We are literally calling the farmers personally a few days before the event and telling them how many oysters we need harvested," organizers said. "They will then go harvest them and ship them directly to Covington! These are fresh oysters harvested at the peak of their season." There will also be four food vendors available for additional food options. There are four levels of tickets available, three of which are named for Goebel's nicknames. The Boss Bill ticket is $20 and gets you admission, a pearl bracelet, access to the enclosed tent, a half dozen raw oysters, unlimited drinks, and a food ticket redeemable at any food vendor. The Kenton King ticket is $50 and scores you the above-listed items and more: One dozen oysters and two food tickets are included at this level. $75 gives you the William the Conquerer ticket which comes with all of the above. Corporate sponsorships are also available at $449. That level gives admission to ten people, ten bracelets, tent access, sixty oysters, unlimited drinks for ten, thirty food tickets, and a sponsored table sign. "This event will fund a legacy piece designed to honor William Goebel and a Covington resident," organizers said. "Like Goebel, this legacy piece will focus on individuals who love their city, support their city and make our city brighter through just being their quirky selves. We intend to have this event every year." 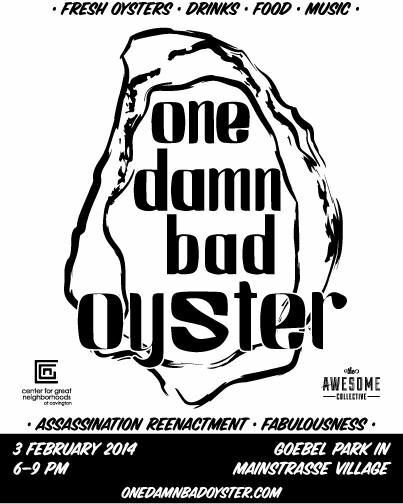 The One Damn Bad Oyster Party is scheduled for Monday, February 3 at Goebel Park from 6 - 9 p.m. For more information about ordering tickets, click here. See the Facebook event, too.